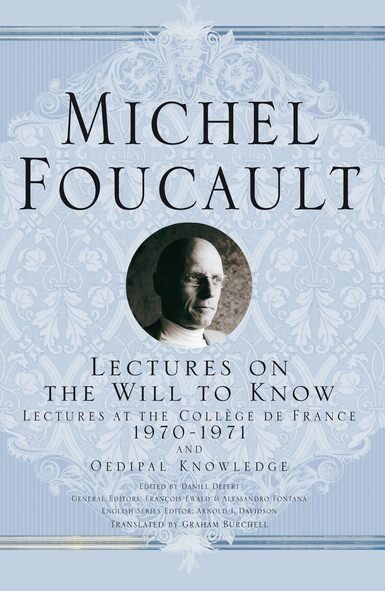 In celebration of the publication of Michel Foucault’s Lectures on the Will to Know: Lectures at the Collège de France, 1970-1971 (Palgrave Macmillan, 2013), we invite participants to a conference in New York City. This conference gathers a group of established and emerging scholars to analyze Lectures on the Will to Know – its sources, themes and intellectual, historical or political contexts. What are the multiple ways that “truth” and “origins” are developed in Foucault’s work? How do philosophy and history intersect in this text? What is “will” in a Foucaultian context and how can we think of “the will to know” without reinstalling sovereign subjectivity? How do Foucault’s encounters here with Aristotle, the Sophists, Nietzsche, Deleuze – indeed, with the possibility of an origin of Western knowledge — complicate our understanding of his genealogical approach?